“As it is in Heaven,” a play written by Arlene Hutton, explores generational conflict through the eyes of nine women in a Shaker village in Kentucky. Set in 1838, the play celebrates the music and dance traditions of Shakers, the “Society of Believers.” They meet in plain meetinghouses where they march, dance, sing, twitch and shout. When newcomers start to see “visions,” however, others don’t and start to question their own devotion. The all-female cast of characters includes: Brooke Herbert as Peggy; Ari Howell as Hannah; Becca Goldberg as Phebe; Jessie Scales as Betsy; Coral Cohen as Rachel; Christine Wood as Izzy; Cathy Velarde as Fanny; Jamie Cahill as Polly and Ana Brett as Jane. Cathy Velarde said that her character, Fanny, is a young character who sees “visions” of angels. Shangraw said that they’re not going to use video to show visions onstage. “We’re going to use flashing lights,” he said. The type and intensity of light will be left up to Todd Carpenter, the show’s lighting designer. Ari Howell and Jamie Cahill, who play characters that don’t see visions, said that working on the play has been interesting. Both said they were exhausted after rehearsals. “All that working is for the birds,” Ari joked. Becca Goldberg, who plays Phebe, gets to sing a few songs.“There’s no music accompaniment at all,” Goldberg said. However, Goldberg has assistance from the play’s choral ensemble, which includes: Sasha Mercuri, Emily Brittain, Kaylee Spates, Madi Cox (who is also Choral Director), Gabby DiMarco, Ali Timmons and Andie Huebsch. The challenge for those setting the stage, costumes and music for “As it is in Heaven,” is that everything must be created in a simple, humble, and unassuming way like the Shakers themselves. Costume shop members worked closely with Minnie Christine Waters, the show’s designer, to ensure that the costumes that they selected matched the period. Members included: Riley Lynch, Madeline Otto, Jacob Gershel, Cooper Smith and Ruby Day. Scenic designer Cody Oyama was up to the challenge. His set that he created for “As it is in Heaven” is simple, yet slanted. Since Oyama plans on majoring in set design in college next year, they gave him ‘carte blanche’ to do what he wanted, Velarde added. 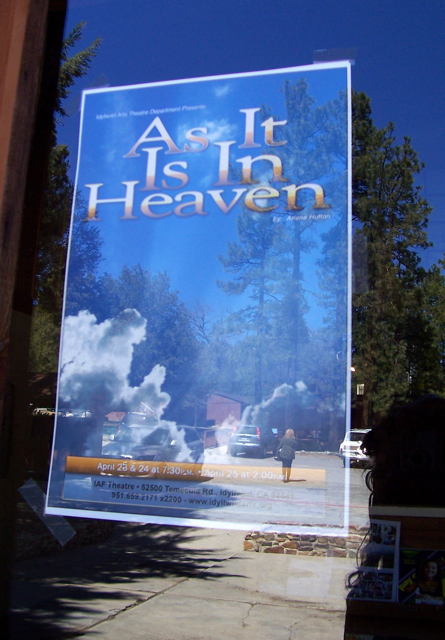 “As it is in Heaven” will play three free shows next weekend, starting Friday, April 23 and Saturday, April 24 at 7:30 p.m., and at 2 p.m. on Sunday, April 25, at the Boman Theater, located on the Idyllwild Arts campus, at 52500 Temecula Blvd. 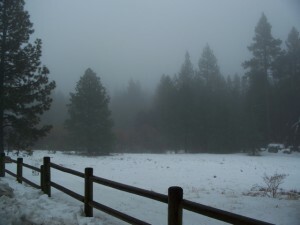 (at the end of Tollgate) in Idyllwild. For more information, call Idyllwild Arts at (951) 659-2171, ext.2206.